Biedermeier is a fruit tea that will definately get you addicted to it. Biedermeier fruit tea with apricot aroma! 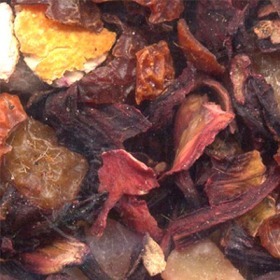 Rosehips, hibiscus, apple peels, and lemon peels with apricot aroma. Infuse 2-3g (approx 1/10 oz) of fruit melange infusion in a cup (225ml) of hot boiling water for 5 to 8 minutes. Add sugar or syrup if you like. Great as Iced Tea!